Dominion Command of The Royal Canadian Legion is seeking candidates who may wish to participate in the world’s largest marching event held in mid-July in the Nijmegen area of Holland. For over 10 years, the Legion has made annual grants to the Canadian Armed Forces team to enable them to visit Vimy Ridge, and the CAF has reciprocated by welcoming a Legionnaire to the team. The Nijmegen March entails four days of walking more than 40km per day with a 10kg backpack for each soldier. Historically, more than 7,000 military and 40,000 civilians from all over the world participate in this event. Members interested in applying to participate in the 2019 Nijmegen March are required to complete and submit the application form to their Provincial Command office by February 15th, 2019. In addition to email reminders, we will be doing a direct mailing to all non-renewed members this March. Please process your Branch’s member registrations and renewals through the Member Services Website or by sending them to Legion House to ensure your Branch’s member data is up to date. Any members not processed by February 25 will receive a mailed reminder. A new poster is available to download to help Branches promote the one-year memberships available to Canadian Armed Forces and RCMP members. 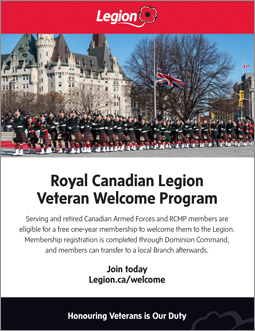 Serving and retired members of the CAF and RCMP new to the Legion are eligible for a free one-year membership to help them get to know our organization. Membership registration is completed through Dominion Command, and members can transfer to a local Branch afterwards. On January 30th, Bell will host its annual Let’s Talk Day in support of mental health. For every applicable text message, call or social media post, Bell will donate 5 cents to mental health initiatives across Canada. The Legion also offers mental health supports to Veterans and their families. The Legion’s Service Officer Network can assist Canada’s military and RCMP members in finding programs and services to get the help they deserve. If you know of a Veteran in need, encourage them to reach out to a Professional Command Service Officer. The Dominion Executive Council meeting minutes from November 25, 2018 are available to view on the Member Services Website. They are located under Branch and Command Resources / Dominion Executive Council. As per the concurred resolution at the Dominion Convention, Chapter 5, subsection 509 of the Ritual, Award and Protocol Manual, initiation of a Branch Service Officer has been amended to include: It will be your duty to entrust, secure and to handle all personal information in accordance with the requirements applicable to privacy legislation. A new subsection 133 has been added to Chapter 1 of our Manual, as approved by the Dominion Executive Council: If a Ladies Auxiliary member becomes a Legion member for extenuating circumstances such as their L.A. is surrendering their charter OR they transfer to a Branch that does not have a L.A., medals awarded by the Ladies Auxiliary may also be worn on Legion Uniforms. The existing subsection 133 will be renumbered to 134. We have also received a number of inquiries pertaining to Legion Dress. As a reminder, it is important to read Chapter 1 of the manual, which outlines what can or cannot be worn as Legion Dress. We’re excited to announce that Waterloo Branch 530 in Waterloo, Ontario has won $2,500 in VIA Rail tickets in our latest Branch contest! Thank you to everyone who submitted their Branch rate to enter. You’ve made it easier for your members to keep supporting the Legion year after year. Enter your Branch rate today for the Member contest currently running! 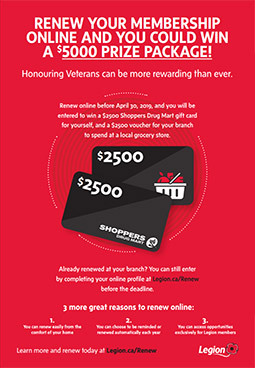 In the January and March editions of Legion Magazine, members will be encouraged to renew their membership online in order to win a $2,500 Shoppers Drug Mart gift card for themselves and a $2,500 grocery store voucher for their branch. Having your Branch rate in the Member Services Website will make it easy for your members to renew! Members renewed through the Branch can also enter by creating their online profile before the deadline. Legion logos are available on the Member Services Website under Branch and Command Resources / Marketing and Public Relations for Branch use. Please note that registered trademarks may only be used as outlined in the Legion Brand Manual. For any inquiries regarding use of registered Legion trademarks, contact marketing@legion.ca. When talking about your Branch or Command work publicly, have a few specific examples ready. It’s fine to say we support Veterans, families, communities and we promote Remembrance – but throw in an example of what that means on the ground; e.g.“For example, our Leave the Streets Behind program helps get homeless Veterans off the streets.” Learn enough about your example to give a few more details about it if asked.